Spectacular Custom Built Executive Home located in Avila, Tampa Bay's Premier gated Country Club Community. Offering 5 bed-rooms and 5 full baths, this home is a must see. Privately located on a quiet preserve lot, on a cul-du-sac, this bright open floor plan is perfect for family gatherings and Florida's entertainment. Featuring soaring ceilings throughout, upon entering you are greeted by the impressive marble flooring, formal living room with fireplace, and formal dining room. The Owner's suite is situated on the first floor nestled away for privacy, and close to one of two offices. The gourmet kitchen having rich wood cabinetry and granite counter tops opens to the large family room with most rooms overlooking the pool lanai area and private setting. There is an additional bedroom downstairs, as well as a media room, and large office having built-ins. Upstairs you will find a huge bonus/game room, three bedrooms and two baths. 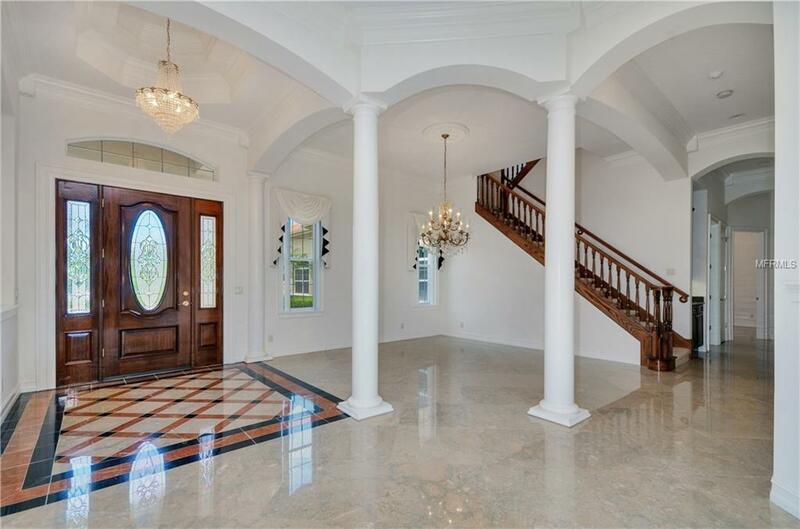 Crown moldings, marble flooring on the entire first floor, wet bar, outdoor kitchen, heated pool and spa, abundant closet space, central vacuum, over-sized 4 car garage, lush landscaping and privacy complete this wonderful estate! Home Warranty included!